Join us for The Brentwood Library's Annual Tree Lighting at 5:30pm. 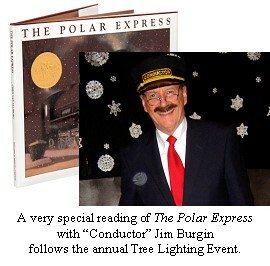 At 5pm and 6pm, there will be readings of The Polar Express in the Periodical Room. Everyone attending The Polar Express reading must have a ticket. The event is free, and tickets will be available ahead of time. For more information about the Tree Lighting, please contact Brigid Day at 615-371-0090 ext. 8510.